Main Street Beef Burger: 100% grass fed beef patty, double smoked bacon, caramelised onion, cheese smoky BBQ sauce, garlic mayo, lettuce and tomato. When tummies grumble around the Broadbeach area, follow the locals to Main Street Burger Bar. A modern and bright interior awaits, styled with crisp white tiles, potted greenery and casual bar tables set under exposed Edison lighting, creating a relaxed space ideal for kicking back with friends to enjoy a mouth-watering burger and icy cold beer. Main Street Burger has created a menu using the freshest produce available, with 100% organic grass-fed beef, free range pork, chooks and eggs. 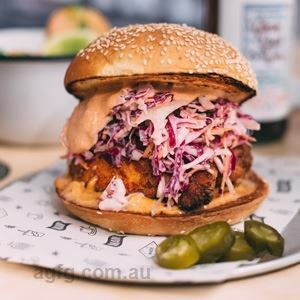 Tuck into an Old School Chook – crispy friend chicken tenders with garlic aioli, oak leaf lettuce and tomato with a side of sweet potato fries, or perhaps you’re a Fancy Joe – double beef, double cheese, double smoked bacon, caramelised onion, raw beetroot, truffle mayo, oak leaf lettuce and fresh tomato. All damn day we are repping $5 Frothys for those who like to wet lip ready for the weekend! Call us on (07) 5531 7703. Kill those Winter blues with happy hour! Every day from 5pm-6pm. Call us on (07) 5531 7703.